The true TTS is very simple and lightweight, there are a variety of toe and cartridge choices, I'm utilizing a Dynafit Speed toe, Voile Switchback X2 cartridges, and the TTS hold down block. 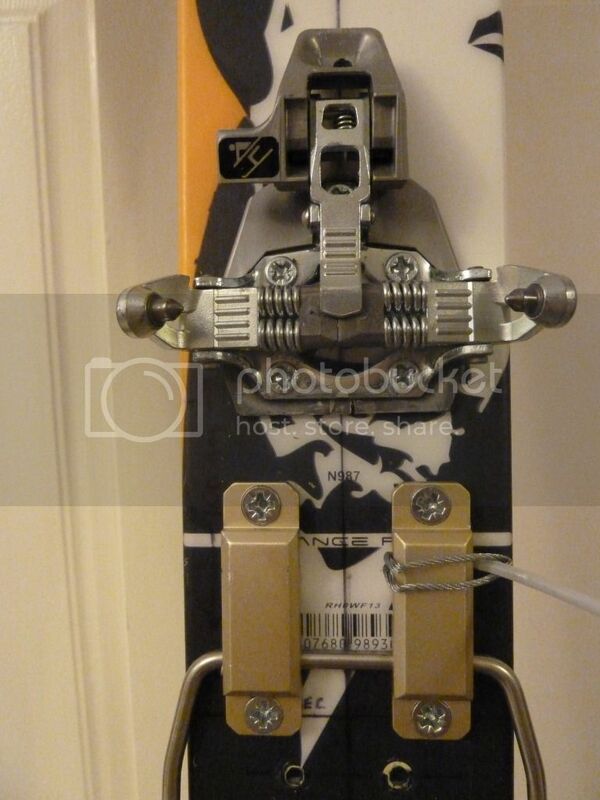 The binding is close to the same weight as a Switchback, but has the potential for a lot more activity and it releases. The Rossi BC 125 has a full steel edge, aluminum tail protector with skin notch, and fishscales in the middle third of the extruded base. The construction of the ski is part of Rossis BC line, so there's no metal in this ski, just a lightweight wood core and some fiberglass. The scales work well for low angle climbing, esp for places where skins would be an overkill. I often use skins with the Rossis, so where I find the scales most helpful is when I have pulled the skins and still need to do some mild climbing or some kick and glide, for this the scales work excellent. This set up is a true lightweight tele rig for backcountry, the ski is wide enough and stable enough for skiing fairly steep stuff, about the only limitation I found was skiing deep heavy snow in Oregon, in which case the ski is relatively soft so it got kicked around a bit. 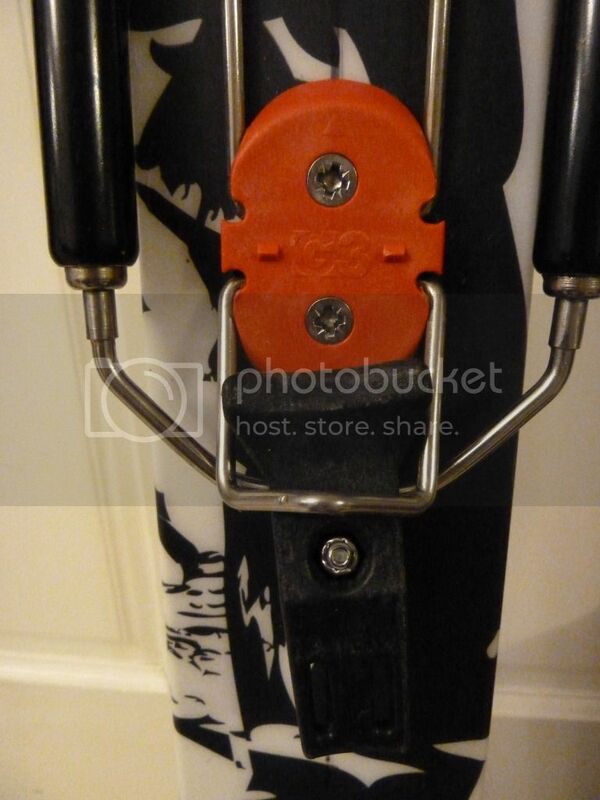 I have skiied boiler plate and ice on these skis and though they chattered up a storm, the edges held fine. In fresh snow the tips are plenty wide for floating bigger skiers; I'm 200#. I have the TTS mounted boot center ~2cm rearward of edge center; I don't trust the Rossi graphics for mounting, they are not consistent. I am using the double climbing post, low G3 heel (~6mm) which works fine with my Scarpa TX mondo 30. I am using the rearmost mounting position. The activity level is on par with a Hammerhead position three or so. Range of motion is a bit limited when using the Voile cartridges, but there are some proprietary cartridges in the works which will increase ROM for the "knee draggers" out there. I don't have a bare ski weight, but they are listed by a couple shops as weighing 2500-3000gm a pair. 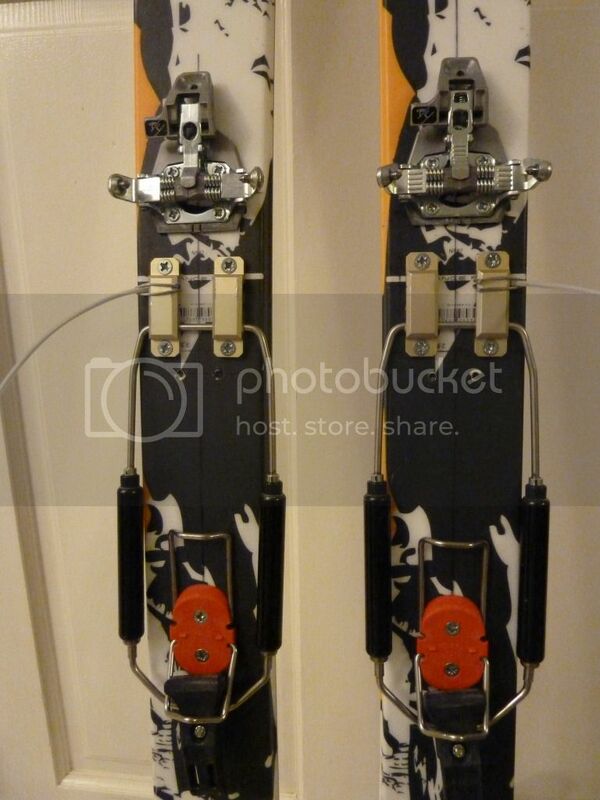 The TTS bindings add another ~975gm per pair. So the complete set up in a 175cm weighs in at less that 4000gm, or about 8.5 # for you 'mericans. For perspective, the popular Voile Switchback weighs 1450gm, so the TTS cuts that weight by 1/3 and offers a release. Yup, that's right, the TTS toe does release. It's not a very sophisticated release, more of less you have a low level release with the toe in ski mode, and a high level release with the toe in tour mode. I did some rough torque tests and got ~ Din 5-6 with the binding in ski mode, and ~ Din 10-11 with the binding in tour mode. I have had multiple releases so far, all were "necessary", the most recent was in Vermont when I stuffed a tip into some heavy snow while moving slowly; and the ski just popped off. If someone were to ask the classic question: If you could only have one tele rig, what would you want? Last edited by Nurse Ben on Mon Mar 25, 2013 6:32 pm, edited 5 times in total. Hi Ben, thanks for the report. How does the TTS set up ski on the downhill? Specifically, how does the lateral support compare to binding like the HHs or Bulldogs? How does the TTS set up ski on the downhill? Specifically, how does the lateral support compare to binding like the HHs or Bulldogs? Are you familiar with Dynafit tech bindings? The lateral stablity is maintained by the toe, so even though the TTS doesn't use the tech heel, the tech toe is more than adequate to maintain lateral stability. Truthfully, there is no comparison with a duckbill or NTN styled toe interface, since there will always be some lateral movement due to poor tolerances between a plastic toe and a steel bale, made worse over time by sole/bale wear. The only time I have significant lateral play with TTS is when the binding releases. I weighed this set up the other night, it was 4074 gm for both skis and bindings combined, so quite light for such a versatile rig. Compare that to my Gotamas which weigh more bare, sans bindings, than this set up. When I was looking at binding weights on Voile's website, I was suprised to see that the TTS was so much lighter than the Switchback, makes a nice argument for TTS. About the only thing I'd like to see new for TTS, other than the upcoming proprietary cartridge and toe piece, would be a lightweight/softer flexing boot. Some folks were hoping that NTN would allow for a lighter weight boot, but so far that hasn't happened, and honestly with how the NTN binding is developing, a lighter weight boot probably won't work and would be a bit of a contradiction for such a heavy binding. I'm not one for soft boots, in fact I quasi retired my generation Scarpa Terminator this season and bought some 2013 Scarpa TX Terminator; dig the new colors, not orange! Watch Mark's website for new on the new cartridges and toes. I have put in some more days on the "standard" TTS, both resort and BC, all kinds of snow conditions from very firm (East Coast Powder) to heavy mank to fluffy Utah pow. I still have my "homebrewed" TTS Axls mounted on Blizzards and the "standard" TTS mounted on the Rossi BC 125. I have come to prefer the standard TTS, esp for BC skiing as it is so light and easy to use. I can really feel the weight difference between the two systems, 974gm per foot for TTS and 1500gm per foot for TTS Axl. The TTS Axl has more range of motion, but I don't find the limited ROM on the TTS to be an sort of a problem. I'm still skiiing the TTS with Scarpa TX, I find that this "T2" level three buckle boot is a nice compromise of power, flex, weight, and touring comfort. I just ordered some Scarpa Carbon Fiber F1, which is rando race boot with tech fitings. There are three versions: standard with tongue 1250gm, race without a tongue 1100gm, and carbon race which has a carbon fiber cuff and no tongue 950gm. Compare these weights with a TX at 1750gm, it should make quite a difference on the up! Scarpa is closing out the F1 boots, so they are getting hard to find, but if you have a smaller foot you can buy direct from Scarpa and score a $750 boot for just $250!. The F1 are quite a bit softer than a TX, on par with a Libero or Excurion, though they have a tall cuff like a T2. I like the look of that TTS binding. It seems a lot less cubersome than the NTN. This months BC mag has it as the Editor's Choice. Even with all the pictures I still don't get how the toe is held on though... Guess I'll have to see it in action. The only "normal" people are the ones you don't know. I have a set of TTS with Voile X2 cartridges on my Rossi BC 125 and it is an awesome light set up, no issues with snow build up, perfect on the uptrack, and the down is as good as it gets. 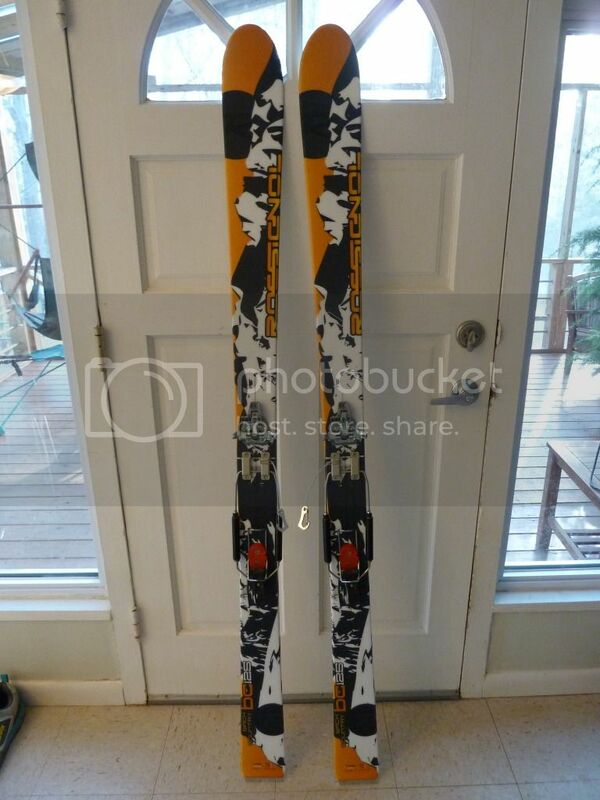 Once Summer sales set in, I'm looking to pick up some Voile BC skis, probably Chargers as I think those are the skinniest Patterned skis they build.